My first experience as a volunteer counsellor was for a hospice, seeing bereaved partners and family members over two years. Rather than providing 'full-on' therapy sessions most clients wanted pastoral support - someone to be with them, hear their stories and simply provide a shoulder and an ear whilst they experienced grief. There were exceptions however. Sometimes they were being prevented from being able to mourn fully because of external or internal issues. When these were resolved clients were able to quietly carry on by themselves. Even if there are no other issues, it can help to have someone to share the journey, to be there to listen and provide support - who understands how long the mourning process can take. A stranger you can confide in. If you have lost someone close hopefully the extract below may be of some use. It is from a handout, and ties in with the picture above. Mourning is a very personal journey, and does not have a set timetable or universal check list of stages to be gone through in order and ticked off, one by one. "Imagine you are sailing along in a small boat on the river of life. All of a sudden something catastrophic happens to you and someone dies. 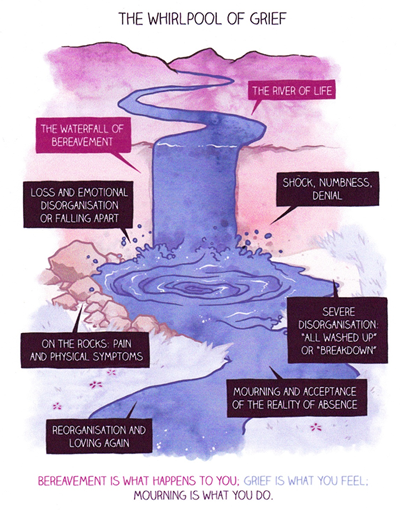 Grief feels like your boat has fallen over the edge of a waterfall and you are suddenly plunged into the whirlpool below. The whirlpool carries you round and round, visiting the same emotions time and again, with the occasional respite in the shallows and the risk of being cast against the rocks. The time spent in this period of disorganisation will vary and some who have been washed up on a bank will choose to stay there. But when the time is right for reorganisation, the ‘River of Life’ leads away from the whirlpool to calmer waters. Your boat is patched up and you sail off on a new river. Richard Wilson (1992) comments on this model: ‘It may be a little fanciful. However, it is less rigid than suggesting that there are stages of grief which must be completed? People cannot be healed by shepherding them through a fixed treatment plan; however, we may be of some assistance as they make their way along their own difficult and personal journey. Grief is a turbulent time, and although there may be precious periods of calm, violent emotions which had seemed to be over can return. They are innumerable and all valid. In grief there is a disorganisation of life and thoughts and values, but most people are then able to reorganise their life in a new way. Although old emotions can always return in almost the same intensity, they do so less frequently and for shorter periods of time."